Based on reviews from 904 experts and 135,666 users. Learn how our rankings work or see our guide to white running shoes. Updated Apr 2019. Although many people would argue the opposite, white is a color – the lightest one, at that. What sets it apart from other colors is that it is achromatic. This means white has no hue, like the different neutral colors black and gray. White reflects and scatters all visible wavelengths of light, which is in contrast to black that absorbs visible light. Because of its light and pleasant appearance, the white color has been associated with purity, cleanliness, simplicity, and innocence, all of which are positive and likable traits. While some would connect white to something as superlative as perfection, it is not without its undesirable links. Others see white as cold, empty, or monotonous. With all these concepts, be it positive or negative, it could, therefore, be asserted that white is a color. The symbolism behind the color might differ from one person to another, but it is worth noting that if you associate white with any aspect at all, then you recognize that it is part of the color spectrum. It is common knowledge that any white-colored object has an easily-dirtied appearance. The bright and clean look of white items makes them prone to soils, stains, and discolorations. White running shoes are no exception to this attribute. If you own or have owned a pair, you would know that the upkeep of white running shoes is a challenge. Of course, if you like the color, this should not hinder you from using them. Despite white shoes being high-maintenance, the classy and straightforward look of white makes them worthy of the effort. What colors go with white? What better to pair with white than its polar opposite, right? Black-and-white running shoes are frequently available as an option from many manufacturers. As a shoe, the black-and-white combination conveys simplicity and straightforwardness. These colors are also very easy to match with because they match with virtually any color. Some examples of black-and-white running shoes are the Skechers GOrun 600 in the men’s Black/White colorway and the Nike Free RN 2018 in the women’s White/Black. This color combination is considered a classic because of its timeless and elegant appearance when together. Blue conveys cool, calm, and collected, while white is fresh and clean. Blue-and-white running shoes give off a unique vibe that’s in between royal and chic, depending on the shades involved; such a combination is indeed not difficult to like. The Asics Roadhawk FF in men’s Ink Blue/White/Black and the Asics Gel Cumulus 20 in men’s Race Blue/Peacoat are great examples of this color scheme. Purple by itself is already a breathtaking and elegant color. When partnered with white, the result is a look that is both stylish and modernized. Purple-and-white running shoes permit a unique expression of the wearer’s style and personality. Some examples of running gear with this color combination are the Brooks Adrenaline GTS 18 in women’s Purple/Pink/Silver colorway, and the Under Armour Speedform Gemini 3 Graphic in women’s MDN/Purple Rave/Overcast Gray. Like black, gray is also a neutral color and is considered to be a “friendly” color, in the sense that it is flexible with other colors. Gray and white together convey a design that has been well-thought of. Gray is always trendy, yet with a minimalist approach that is also a softer alternative to black. Gray-and-white running shoes allow for versatile wardrobe options. 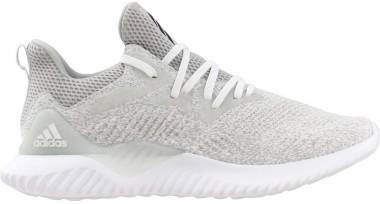 The Asics Gel Nimbus 20 in men’s Platinum Carbon/Silver/White and the Nike Epic React Flyknit in men’s Grey/White colorway. Saucony Freedom ISO 2. The Freedom ISO 2 from Saucony is a neutral running shoe that boasts of a dynamic performance, making it ideal for everyday runs. Available in a White option for both men’s and women’s versions, the Freedom ISO 2 presents a unique structure that encourages natural movement and prevents skin irritations. New Balance 890 v6. A fresh-looking shoe for the roads that promotes its lightweight yet well-cushioned midsole. 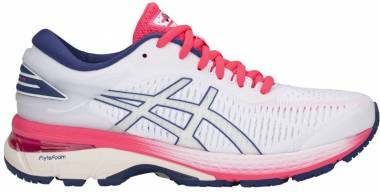 This high-performing white running shoe is perfect for up-tempo runs and half-races. 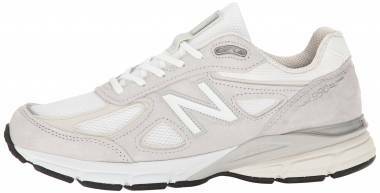 The 890 v6 comes in men’s White Munsell/Black/Hi-Lite/Maldives Blue colorway. Nike Flex Experience RN 7. The Flex Experience RN 7 features a one-of-a-kind structure, in which the midsole also serves as the outsole. This shoe aims to bring maximum flexibility while also providing adequate impact protection for the foot. The shoe is available in the men’s colorway of White/Black/Wolf Gray, which is the perfect blend of neutral colors for a layout that is pleasing to the eyes. Brooks Glycerin 16. Attested by wearers as an ultra-comfortable shoe, the Brooks Glycerin 16 is ideal for daily activities on the road. Although a bit expensive for some, this white running shoe has surpassed expectations on design, breathability, and features. The Glycerin 16 comes in the White/Blue/Pink colorway for the women’s version. Nike Air Zoom Pegasus 35. This legendary running shoe comes in the women’s colorway of White/Summit White/Pure Platinum, an all-white package that delivers a sturdy framework, a steady ride, and a comfortable platform. The Air Zoom Pegasus 35 has a broad fan base that consists of both series loyalists and new admirers. Adidas Terrex Agravic. The Adidas Terrex Agravic is a neutral running shoe that is designed for the trails. Many users expressed their admiration for the shoe’s durable upper, responsive midsole, and sticky outsole, as well as its excellent performance on technical, muddy trails. The Terrex Agravic is offered in the men’s colorway of Non-Dyed/White/Black, an unusual yet welcome option in trail running shoes. Salomon S-Lab Sense Ultra. Runners who are searching for a trail gear that provides a secure fit that does not sacrifice comfort and cushioning should look into the Salomon S-Lab Sense Ultra. The shoe received numerous positive reviews for its breathability, durability, and versatility; it was also relatively lightweight for some. The S-Lab Sense Ultra is available in men’s Blue/White colorway, which offers a refreshing sight to the eyes. Under Armour Horizon KTV. This trail running shoe from Under Armour is designed to handle fast-paced runs and technical terrains. As part of the brand’s mountain running series, the Horizon KTV packs responsive cushioning and excellent traction in a nimble and lightweight running shoe. The shoe’s Elemental/Black colorway features a unique take on white, as the shade slightly leans on the ecru side, but not too altered that it becomes an entirely distinct color. The North Face Endurus TR. The Endurus TR is a solid trail-running option for ultramarathoners or athletes who frequent long trail runs. This shoe has a firm structure yet a flexible platform, and it has awed users with its dynamic protection and maximum-level performance even during extreme conditions. The Endurus TR has a color option of High Rise Gray/Zinc Gray in the men’s version, which presents a dusty, rugged version of white that makes the shoe suitable for the outdoors. When should I wear white running shoes? Fashion enthusiasts have a divided stance about the best time to wear white. Some insist that white is a color for the season of warmth – summer; meanwhile, others are convinced that white also befits chilly weather, especially during the winter season. Although the topic is up for debate, wearers are entirely free to decide on when they should use their white running shoes. Of course, this is also making sure that the shoes are you are wearing fits the intended purpose: road-running shoes for the road, trail-running shoes for the trails, and so on. Are white running shoes more comfortable? The comfort level of a running shoe is not dependent on its color. Quite the contrary, running shoes are more comfortable if you are wearing a pair that matches the size and build of your foot. As a runner, it is crucial that you consider the fit and feel of the shoes first before looking into its appearance. For example, overpronators should purchase a stability shoe that supports their low arches, and severe overpronators should pick a motion-control shoe. Likewise, competition runners should search for a racing shoe, and triathletes would perform best in an appropriate shoe. No matter what type of running activity you are looking into, a white running shoe would undoubtedly be available for you. Is there a unique way to clean white running shoes? It is a given that white running shoes are more challenging to maintain its cleanliness compared to other colors because of its light and flawless appearance. If you prefer your white running shoes to be spotless, you may want to clean them more often than you would shoes in other colors. All-white running shoes require extra attention in the outsoles because the dirt and mud that would get trapped in between the treads are very noticeable. Use a dry brush to remove the dust from the surface of the outsole. If the dirt has dried or is stubborn, use a mixture of one part baking soda and one-part laundry detergent as a cleaning solution. Remove the excess with a clean sponge or cloth dipped in water. Sometimes, small, fresh dirt marks can be removed by a craft eraser. Simply rub the eraser on the area and dust off the shavings. You’ll be surprised to see how well it works! In cleaning the upper of your white running shoes, you have to take note of the material it is made of to ensure you are using the suitable method for it. Soft textiles like mesh could be easily handled by a soft brush. Other materials such as leather should be prevented from getting wet; thus, a simple wiping or dusting with a dry cloth or brush should be able to do the trick. When not in use, store your white running shoes indoors, preferably inside a cool and dark space. Unwanted sun or heat exposure may cause fading or discoloration, and possibly even shrinkage, to your white running shoes. Do white running shoes have a shorter lifespan? The lifespan of your white running shoes is not a standard value. Instead, it is reliant on how often you use it, the quality of construction, the materials used, and, of course, the amount of effort you put in to take care of it. With that said, the color of your shoes does not determine how long it will last; the lifespan of your white running shoes is dependent on your usage of them. A way to check the usability of your white running shoes is through the midsole. If this part is starting to develop deep wrinkles, the foam is beginning to wear out, and the cushioning is deteriorating, as heat and moisture warp the midsole.